Jeremy (my pastor) approached the older man somewhat timidly. Jeremy didn’t move. He’d thought the conversation over and over in his mind, but as he stood before the man, all words died in his throat. Brother Hicks nodded, seemingly understanding. “Let’s sit down.” And so they did. They sat across from each other at a scratched up table, both silent for a long time. Now, as I mentioned before, I really have no idea how this happened. In fact, I made most of it up—but the truth still remains: Brother David Hicks asked my pastor a beautiful question. A question that, before marriage, should be one more important question asked and answered truthfully by your heart. Can you live with him? You obviously think you can…or why else would you consider him? But that’s not the real test. 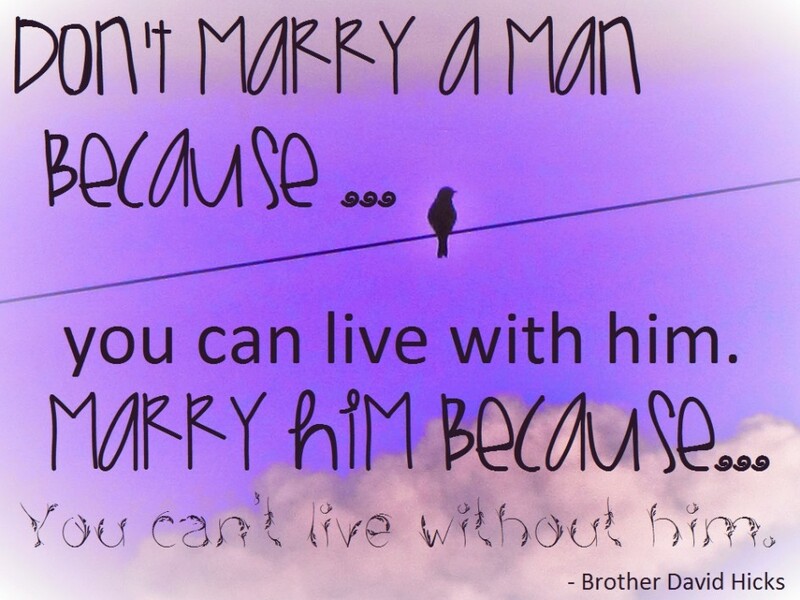 Can you live without him? The Bible says love is strong as death (Song of Solomon 8:6), which means that if you love someone, it’s more than just caring. In our world today, we’ve lost sight of what true love is. We marry out of lust. We marry out of warm affections. We marry because we find a person who “goes good with us”. Want to know why so many couples are divorced? Because they didn’t know what true love was, and they didn’t have the patience to wait for it. My pastor and his wife, Jeremy and Vera Raby, have been married for sixteen years. They have five lovely children. They run a wonderful church, and have a ministry that God’s blessed beyond all measure. Where would they be if Jeremy had settled for someone he just cared for, instead of waiting for the woman he couldn’t live without? Wonderful bit of truth as always. Thank you!